We teamed up with Gulf of Alaska Keeper and hundreds of volunteers for one of the most ambitious marine debris recovery and recycling initiatives ever attempted. "It's hard to imagine just how much trash has washed onto Alaska, until you see it for yourself." On March 11, 2011, the devastating Japanese earthquake and tsunami dumped an estimated 5 million tons of debris into the Pacific Ocean. By the end of that year, the same debris began showing up on U.S. and Canadian coasts. Carried by winds and currents, metal containers with Japanese writing, highway markers, plastic stakes, soccer balls, bottles, shoes, tangled fishing nets and even refrigerators continue to wash up along remote, sparsely populated, and uninhabited shorelines. The sight of floating debris in Alaskan 'wilderness' highlights an unsettling new reality: our oceans are filling with plastic, and this globally destructive problem isn’t going to fix itself. Marine debris, especially in the form of plastic, poses large biological and physical threats to sensitive coastal ecosystems. Debris disrupts marine communities, interrupts the food chain, alters the chemistry of the environment, and poses a serious risk to human health. This summer, we partnered with Gulf of Alaska Keeper (GoAK) to address the ‘mind-blowing’ amounts of plastic pollution washing up on some of the most remote and hard-to-reach Alaskan coastlines in Prince William Sound. With the support of our global network of collaborators under the Parley Ocean Plastic Program and A.I.R. Strategy (Avoid, Intercept, Redesign), we will divert waste from landfill, reusing and recycling as much as possible to drive eco innovation and greater awareness of the impacts and threats of plastic pollution. But before we can give debris a second life, we need to know what we’re working with. 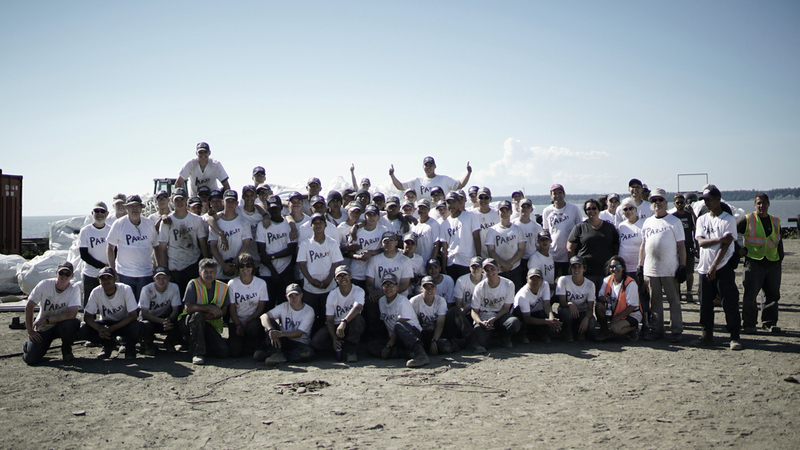 During the Great Alaska Marine Debris Sorting Project, Parley and hundreds of volunteers sifted through more than 2,500 cubic yards of debris that had been transported to the Port of Anchorage following a summer of coastal cleanups led by GoAK. Volunteers began sorting through buoys, ropes, styrofoam, plastic bottles, fishing gear, and tsunami debris on July 16, and continued for five days in 8-hour shifts, until the waste — all 200 tons of it — was organized for recycling. The entire process required about 2,560 man hours to reach completion. Debris was recovered over 40 days of cleanups by a small GoAK team covering 10 miles of coastline on the remote Montague and Kayak islands, which had been labeled high-priority for cleanup by the Alaska Department of Environmental Conservation. Though remote and uninhabited, Montague and Kayak islands collect a large number of floating debris due to wind patterns and currents. Over the past 13 years, GoAK has removed an estimated 2.5 million pounds of debris from 1,500 miles of rugged and often unpopulated Alaskan coastline as part of their education, prevention, and cleanup strategy. "There's a tremendous amount of every kind of plastic you can think of, with the most prevalent being plastic water bottles. Millions of bottles...it's astounding how many bottles we picked up. We’re just scratching the surface of the problem, but we think what we do is important because we’re getting the word out about how bad the problem is." Intercepting and transporting more than 1,200 heavy-duty silo bags of debris to Anchorage for the sort required a complex helicopter airlift and massive barge (54’ x 180’) operation made possible through the cooperation of several organizations. The GoAK team spent about a month on Montague and nearly three weeks on Kayak island this summer, living in a boat anchored in the inner coastline and flying by helicopter each morning to the outer shorelines to continue cleanup efforts. Similar to previous summer cleanups, this year revealed an estimated 50% recovered debris from the Japanese earthquake and tsunami, in addition to debris caused by container spills and land pollution. The vast majority of this waste is plastic. Through the Parley x GoAK partnership, our aim is to take cleanup efforts one step further: recycle and repurpose as much as possible to bring global awareness to the issue of ocean plastic pollution and drive eco innovation for long-term solutions. Thank you to Gulf of Alaska Keeper, Alaska Department of Environmental Conservation, Paradigm Marine, Matson Shipping, each and every volunteer, and all who contributed to make this cleanup and sorting effort possible.